The Bay Area Creative Music community mourns the loss of Matthew Sperry. He was killed in an accident on Thursday June 5th, 2003. Matthew was a vital force in the Bay Area music scene and will be greatly missed. Matthew Sperry was introduced to Improvised Music in 1990 while studying avant-garde, world and classical musics at Florida State University. It was there that he met and worked with Wadada Leo Smith and started a life-long collaboration with shakuhachi player Phil Gelb. During the 1990's Matthew worked with a small but dedicated community to perform and present Free Improvised Music to a growing audience in the Northwest. While in Seattle he was also a member of some of Seattle's more notorious music groups, including The Long String Instrument Band, The Black Cat Orchestra, Seattle Experimental Opera, Gamelan Pacifica and iv bricoleurs. Matthew now resides in the San Francisco Bay Area where he regularly collaborates with percussionist Gino Robair and many others. He has performed with an international cast of improvisors, including John Butcher, Wolfgang Fuchs, Gunther Christmann, Jack Wright, George Graewe, Wally Shoup, Phil Gelb, Paul Hoskin, Francois Houle, Carla Kihlstedt, Raymond Strid, Gianni Gebbia, Erhard Hirt, Sean Meehan, Stuart Dempster, Wadada Leo Smith and Dana Reason. 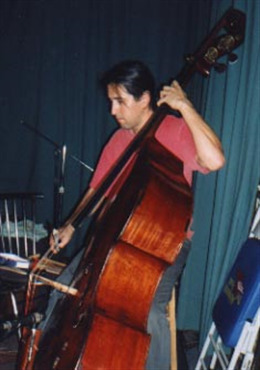 Sperry has received several grants and commissions for composition and performance, including a Meet the Composer grant in 1999 for solo bass improvisations. In 1998 Matthew received an award from the Seattle Arts Commission to give a concert of improvised music with his trio featuring Gino Robair and violinist Carla Kihlstedt. Matthew composes and performs original scores for film and dance as well. He has collaborated with choreographers Sheri Cohen, Crispin Spaeth, Margit Galanter and Lila Hurwitz, Ronly Blau, Joan Laage. With the Black Cat Orchestra and iv (four) bricoleurs, Sperry has helped compose scores for over twenty silent films.